The best longboard bearings are out there waiting to get under your feet and give you that perfect ride every single time. Not all of them are made the same, but they all have one goal, and that is to provide you with satisfaction in your riding experience. Are you looking for the fastest longboard bearing? Don’t be the last one in that downhill ride. Getting the right information is critical to making your final choices. If you’re not much of a speed devil, then you could be in the market for the best longboard bearing for cruising. We’ll cover them all here as we compare 5 of the best longboard bearings on Amazon head to head. We’ll point out the pros and cons of each performance bearings and which one matches a rider’s demand. Though you may not agree with our winner, it pays to be informed. Read on. 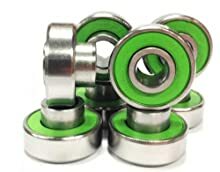 The best longboard bearings for cruising and speed are quality built and a bit pricey but not that much as to break the bank. When you expect high performance, be sure you get the one suited for your demands. First, we look at the type of materials these bearings are made. Generally, there are only two variants to choose from, steel and ceramic. A bearing’s primary function is to lessen the friction between the axle and wheels. There are 7 or 8 balls in steel bearings (9 for ceramic) which help distribute the weight of the load. These balls are lubricated with grease and are shielded from dust. This set up works fine for skateboards. But constant speed on a downhill ride on a longboard may heat up the axel and wheel which causes the bearings to expand and render them useless. Steel bearings are still popular due to its durability and economic reasons. Regular cleaning and lubrication will help prolong the life of your steel bearings. Longboard ceramic bearings are made from a compound called silicon nitride. They are harder and smoother compared to steel. These hardly require lubrication and are not affected by heat, thereby maintaining your skate’s optimum performance. Get only the best longboard bearings for speed and durability. Standard 608: In the skating scene, the 608 bearing has been the standard. It has a 22mm outer diameter, 7mm thick and an 8mm bore where the axle sits. Most of the skating wheels, if not all, will be compatible with the 608 bearing. The standardized size has helped in keeping the cost of the bearings down. Non-Standard: These are very rare and may virtually be non – existent. But you may still come across these types that are different from the 608. Additionally, there are smaller ones that are available that has the exact axle size but would need an extra sleeve to match the 608 outside diameter. If a bearing is given a high ABEC rating, it means it has more precise tolerances than those with lower scores. Ratings range from 1-9, all in odd numbers only. ABEC Rating: ABEC stands for Annular Bearing Engineering Committee, which is a division of the American Bearing Manufacturers Association. They developed a rating system that measures the variations from exact measurement in precision bearings. This has become the standard in the bearing industry. A high ABEC rating pushes the price up. ABEC ratings can be misleading. They are meant to evaluate bearings that are used in machinery but not on skates. Forces that are exerted on skates are very different from industrial machinery. Still, manufacturers put in ABEC ratings. Experienced skaters know well that these ratings may not be as relevant. This is hands down the best-selling skate bearing in the USA. The removable rubber shield makes it easy to clean and protects the ball bearings from the elements. This product comes pre-lubed with Speed Racing Cream from the same makers. It’s a very noticeable difference once you install these in your skates. The quality of ride improves tenfold. Prepare yourself for that ultra-smooth ride. Some have reported overly smooth feeling that they had to re-acquaint with their ride. A simple cautious run around the block is enough to adjust yourself. This Rainy Guy Professional Skateboard Bearing is the non-contact, removable rubber shields. Thanks to this great function, the bear is protected against dirt. Therefore, it makes very easy to clean, and less friction brings the high speed for the riders achieve the best experience. Moreover, this Premium ABEC9 bearing fits every board with high-grade steel which has anti-corrosion treatment for long lasting and has the longest spin at 4mins 20secs in a lab test; It brings the smoothest riding. All of those great factors are contain in Rainy Guy Bearings which is built for high quality at low prices. 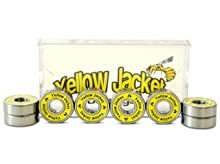 If you’re looking for a low end priced, quality bearing, the Yellow Jacket is what you need. Effortlessly adds 10 to 15 mph to your current downhill speed. It is pre-lubed with high-speed cream. The Bones Reds pale in comparison when tested head to head on the same path, both brand new. It is designed for high speeds out of the box and has the highest precision rating in the market. The yellow seal is professionally engraved and perfect for protecting against dirt. The Yellow Jacket is equipped with easy to remove seal for maintenance. This is a wild card in the skating industry. Given a few more years in manufacturing, the yellow jacket may overrun its closest competitors in no time. Impressive performance that allows your wheels to turn longer when you test-spin them by hand. This is a real test that lets you confirm how easy your wheels turn. If it takes forever to stop, that is a good sign. These may be a bit fast for beginners, so purchase with caution. Professional riders are all thumbs up with this one. So how are they different from the Bone Bearings Reds? These are Precision-grade Swiss design that boasts 25 years in manufacturing history and is skate rated which guarantees better performance than any ABEC rated bearings. Much like its counterparts, the Zealous bearings come with rubber seals that give you ease of access during maintenance and protection against the elements. The secret in their quality is in the lubricant they fill it. The lubricant used contains nano-ceramic compounds that fill in deformations on the bearings. Now, when you use it on your skates, heat builds up, and the nano-ceramic hardens on the specific areas of imperfection. As you continue to use these bearings, the more perfect, it becomes since friction is almost eliminated. This also makes it nearly corrosion resistant. 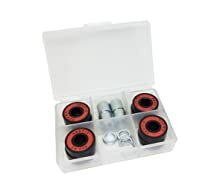 These bearing set also takes out the need for spacers as it is equipped with 409 spacers. It also survives the harshest skating conditions in sandy and dusty environments. The Bones Ceramic Reds Bearings is the most expensive one in the list of bearings here. So that only leaves us with one question, and that is, are they worth it? This ceramic longboard bearing is the one to beat. Of course, higher performance goes hand in hand with a higher price. It is the lighter, stronger, will not corrode and lasts way longer than its steel counterparts. Because it’s pre-lubricated with speed cream, the title of fastest longboard bearings should be awarded to this set. With its high-end features, you’ll run with confidence and push your limits to the max. These ceramic bearings are a dream as it may be the only ceramic longboard bearing you will need. Beginner and intermediate skaters should take extra caution, though. This gives different feedback from your regular steel bearings. It has an almost frictionless feel. The only con we can come up with is its price. This is the only lube you’ll ever need for your bearings whatever make they may be. This doesn’t work like magic though. You have to clean your bearings thoroughly before applying them. That is the only time you will feel the effects. Once you’ve used them, the feel of a brand new bearing is quite evident. Being a light type of cream, it doesn’t last long as lithium grease. You have to re-apply them at regular intervals. The trade-off, however, is the difference in speed. This Bones Speed Cream is designed for those speed devils who are conscious in maintaining their rides. A bottle lasts a long time since you only need a few drops on each bearing. Among all these bearings on Amazon, the Zealous Bearings for Longboards and Skateboards stands out from the rest. Factors include, price range, which is dead center middle ground, easy maintenance, and the brilliant nano-ceramic pre-lubrication that enhances the perfection of the bearings as you use it. It will take a long time before you even notice that it needs some cleaning and lubrication. This is the only steel bearing that could rival ceramic bearings. The built-in spacer works like a charm. No need for separate spacers. The Zealous is the best longboard bearings for cruising. Get your own set today.